So, now I intend to send the books I received on the next stage in their journey and I’d like them to go to a subscriber to this blog. I will choose the lucky recipient by picking a name on June 1st from everyone on my email subscription list as at midnight May 31st. If you are an existing email subscriber to this blog then you will be automatically entered into the draw to receive the 3 books. If you are not an existing email subscriber and would like to be in the draw for the books, please use the box on the right-handside of the screen to register for an email subscription – it is free of charge and you can un-subscribe at any time. If the winner has anything writing-related that they wish to promote then I will also give that a mention when I announce the winner. The winner will be contacted by email to obtain their postal address – if I get no reply within 14 days then I will draw another winner. The winner must have a UK postal address. I’m looking forward to sending the books on their way! P.S. 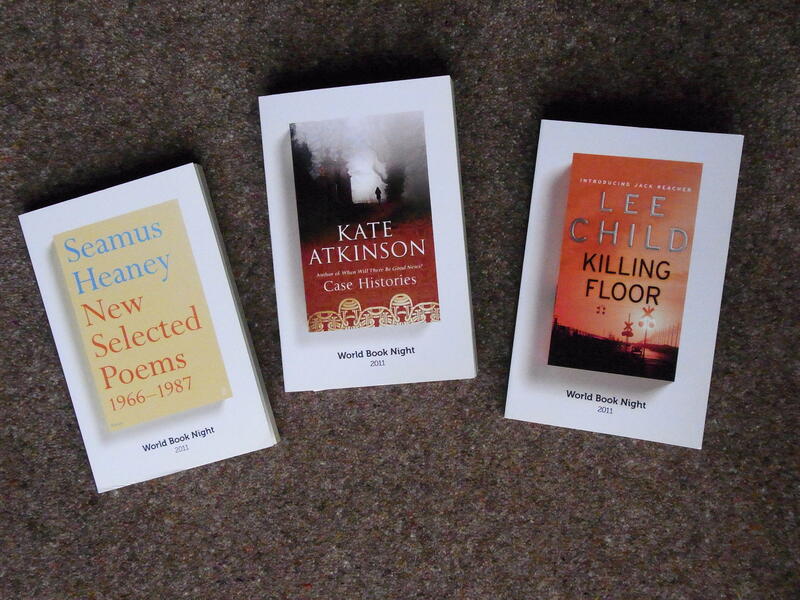 The World Book Night event will be repeated again in 2012 but the date will be moved to 23rd April – the international day for celebrating books. This entry was posted on May 5, 2011, 11:00 am and is filed under Books, Competitions. You can follow any responses to this entry through RSS 2.0. You can leave a response, or trackback from your own site. Great idea Sally. Good luck and I hope the books find another happy home. I try my best! – glad you’re enjoying the blog, Annie. Great idea to pass on the books Sally, I love the look of them, then again I love the look of all books. I can’t pass a charity shop or a car boot stall without buying one. Susan – I’m the same. anywhere that sells 2nd hand books is like a magnet to me. My husband has to drag me straight past these places otherwise we’d never get in the house for books! Nice idea – I’m happy to subscribe and to continue reading your blog. Books make the world go round. Pat – glad you’d like to continue reading the blog. Unfortunately I can’t add you to the subscription list (I guess it’s to do with data/spam protection) – you need to do it yourself using the box to the right of the screen. It’s headed Email Subscription. I look forward to having you on board! I am interested in receiving one of your World Book Night prizes to pass on to a friend when I have read it.